SYNOPSIS: I love films about man battling the elements whether it's desert heat, deep sea darkness or (as in this case) barren cold. This real life adventure details the efforts of the Swedish engineer / explorer S.A. Andrée in 1897 to be the first man to reach the North Pole. His plan is to fly a hydrogen balloon, with the help of two assistants, and claim North Pole glory for Sweden. However, not long after they launch things start going downhill. The bulk of the film details their struggle to survive in the harsh, unforgiving environment. They face freezing cold, lack of food, roaming polar bears and sickness. One of the men had a camera and took photos during their whole ordeal. In one of the film's most unique touches whenever he takes a photograph it cuts to the real-life image that was captured! Max Von Sydow is perfectly cast as the intelligent, determined (and slightly reckless) leader Andrée. The original music score is offbeat and memorable. 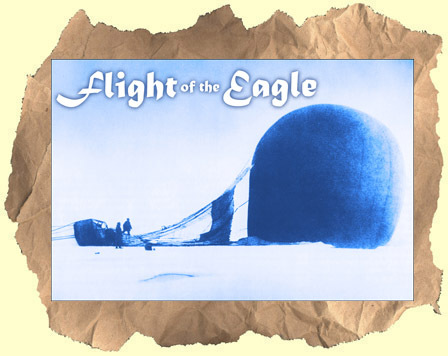 Flight of the Eagle was nominated for Best Foreign Language film in 1983 and yet it has never been released on dvd! Dubbed in English. Recommended.